Ten-year-old Zak Knight watches the WWF King of the Ring pay-per-view event. Unfortunately for him, his younger sister, Saraya, comes in and switches the channel to Charmed, her favorite television program. Not one to take this indiscretion lying down, he begins wrestling with his sister – the winner chooses what to watch. Their parents, Rick and Julia, then come in and are summarily appalled at their subpar technique and suggest better ones. Over the years, the two of them fight in many local wrestling matches, adopting the names Zak Zodiac and Britani Knight. Partly because Rick and Julia are struggling financially, they have been constantly calling WWE trainer Hutch Morgan about signing Zak and Saraya up so their children may prosper. Morgan agrees to hold a tryout before a SmackDown taping, though he tells Saraya to come up with a different ring name, for they “already have a Britani”. Inspired by the show she loved as a kid, she settles on Paige. As soon as the film begins, I must give to give a lot of credit to Florence Pugh, Jack Lowden, Nick Frost, and Lena Headey because they have an amazingly good chemistry together. You will buy that these four people are a family, and they manage to capture all of the subtle nuances of such a relationship. The lighthearted jabs, uncanny memory of embarrassing events, and unquestioning devotion to each other are all there. If Zak and Paige both made it to the WWE, you get the sense they would make an excellent brother-sister tag-team. This makes is all the more heartbreaking when only Paige is chosen to fly to NXT in Florida by Hutch Morgan for that highly desired chance. In a bit of irony, the sibling who had dreamed about being a wrestler all of his life is passed up in favor of the one trying it out for fun. Much of the film after that moment involves Paige adjusting to the WWE style of entertainment. There is no intergender competition and her peers, Jeri-Lynn, Kirsten, & Maddison, have less experience as a wrestler than she does, having been models before signing up. It is from this bit of information many audience members would assume they’re only in it for the glamour. This isn’t helped by Paige coming down to that exact conclusion. Eventually feeling like an outcast, she bleaches her hair blonde and uses a spray tan so she resembles her fellow trainees. Naturally, this only increases the friction between herself and them. This culminates in Paige assuming that they’re gossiping about her on a bus ride when they’re really talking about Jeri-Lynn’s daughter. She has been away from her for several months so she may give her a better life. It’s a moment that makes it easy for those who watch it to come down to an entirely wrong conclusion. What I find admirable about this film is that the role of Paige’s family isn’t diminished just because she ends up being the central focus. Zak’s girlfriend gives birth to their son, and he continues to make ends meet by wrestling on the British independent circuit. He pleads with Morgan to give him another chance, but the trainer makes it clear he will never be signed to WWE. He soon becomes an alcoholic, eventually getting into a large bar brawl when he hits rock bottom. On top of that, Paige learns her parents have been selling merchandise bearing her likeness without her permission. Although it may sound exploitative, it highlights just how poor this family is, and it puts an extra bit of pressure on Paige to succeed. At the same time, they make it clear they’ll support her no matter what she decides to do. For those who don’t consider themselves wrestling fans, it is easy to write off the medium as a fake competition. As Rick, better known as Ricky Knight, is quick to point out, there is a world of difference between “fake” and “fixed”. It is true professional wrestling may not be a legitimate competition, but it doesn’t matter. It is intended to entertain audiences, being a medium unto itself. It is absolutely not fake. Do you see people going around calling films fake just because they depict fictional events? Much like how films need good actors to carry them, wrestlers need to be in excellent physical condition to pull these stunts off and play to an audience. A face isn’t successful until they rally the crowd behind them in droves whereas a heel needs to get those same people to hate them with a fiery passion – in a paradoxically loving way, that is. This is especially apparent when you see the intense training regiments the candidates must endure in order to have a shot at stardom. One couldn’t possibly fake their way through something like that – or getting hit in the head with a trashcan lid either. To some extent, Hutch Morgan’s constant belittlement of the WWE trainees brings to mind Gunnery Sergeant Hartman from Stanley Kubrick’s Full Metal Jacket. Although not nearly as verbally abusive as Hartman, Morgan is as harsh as is because he knows what his profession entails. People can and do get permanently injured in this line of work performing these elaborate stunts. It’s especially justifiable when you consider how many professional wrestlers have died untimely deaths – whether it’s because of having accumulated too many injuries or burned themselves out using excessive performance enhancing drugs over the years. Indeed, his reasoning behind rejecting Zak is because the best he could have hoped for in the WWE would be as enhancement talent, informally known as a jobber. That is to say, he would be paid to be decimated by the talented wrestlers, thus ruining his life. Anyone who can’t handle this regiment wouldn’t last a day in the ring, and he does hand out credit where it’s due. It’s highly fitting that when Paige reverts to her original look, she manages to overcome her insecurities and begin her career with a thunderous debut. It fits in with the advice Dwayne Johnson, better known as The Rock, gave her and Zak when they were first starting: be the first you. Admittedly, this ending is bittersweet when you consider what happened to Paige over the next three years. She would be suspended twice for using a prohibited substance and ended up retiring by the time of the film’s release in 2019, having many lingering injuries due to starting her career at such a young age. It doesn’t detract from the actual film, but it does subvert the triumphant note on which it ends. The late 2010s saw a surplus of biographical features, and Fighting with My Family stands out as one of the more memorable ones. Professional wrestling is one of those subjects that isn’t exactly well-known outside the people who are in the know, so seeing a quality product give an insight to the scene was fascinating. Combined with the all-around great acting performances and you have a film that’s heartwarming as much as it is inspiring. 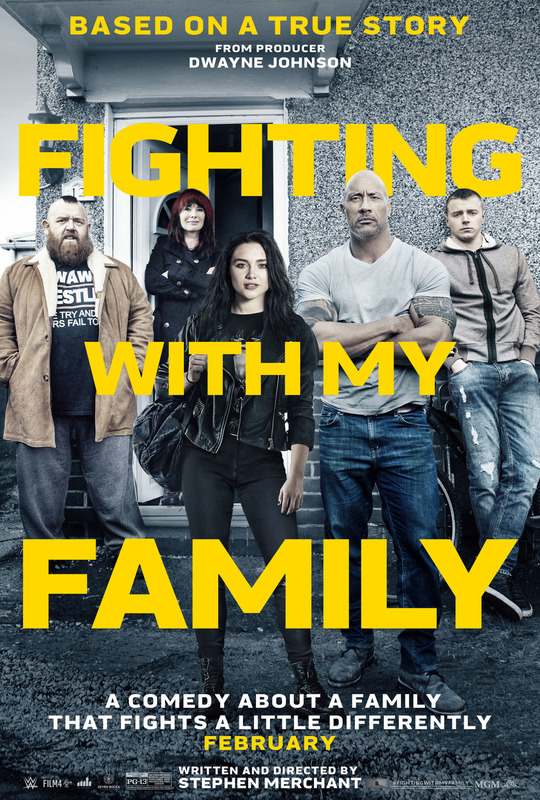 Fighting with My Family is a film I could recommend to someone who doesn’t know the first thing about professional wrestling. Conversely, if you’re already a fan, I can say you’re in for a treat. Real life partly subverted this film tried to say, but that wasn’t really through any fault of the Stephen Merchant or his team, and its messages have plenty of applicability to anyone with lofty ambitions. There were a lot of liberties taken with the story here but unlike Bohemian Rhapsody, they weren’t so egregious in their inaccuracy, mostly for the sake of expedience to keep things moving. Paige becoming the first ever NXT Women’s champ was a glaring omission but I get it would have undermined the feel good finish of her RAW debut. 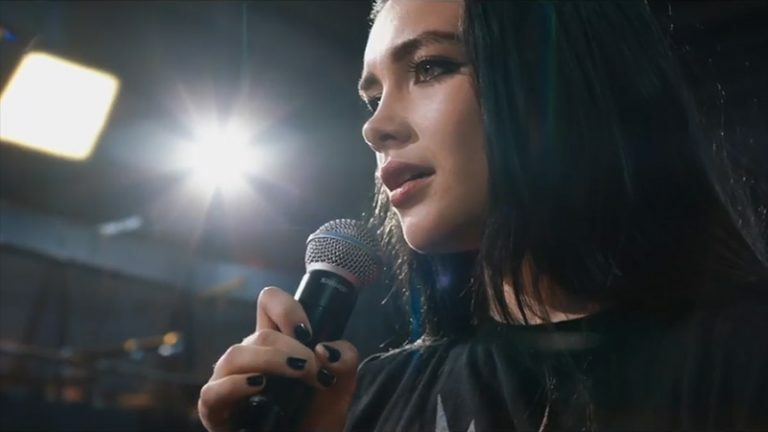 Pugh was great but I just wish they didn’t over egg the outsider element, suggesting she would freeze on the mic when in fact she always very confident in her character on camera from the start, otherwise a hugely enjoyable film and largely truthful reflection of wrestling. Yeah, I think that just comes with the territory of biopics these days. They’ve been good, but I think they could stand to change things up a bit. But you’re right, the changes they made here, such as the outsider element, weren’t too egregious. Any way you slice it, it is indeed a highly enjoyable film that gives a lot of insight about wrestling. Best movie of 2019 so far, in my book. Very enjoyable film. As a fan of wrestling, WWE and Paige, the omission of the NXT women’s title (and all around underplaying of NXT) doesn’t sit well with me, but overall a very enjoyable film. Great review. It’s certainly one of the better 2019 features I’ve seen (though I’ve only seen three so far). Yeah, I’ve come to expect these inaccuracies in these biopics. Real life doesn’t always fit the Hollywood formula, after all (not excusing it, by the way). I do think the film industry is growing a little too reliant on biopics to the point where it’s almost as if they’ve run out of ideas, but this was definitely one of the better ones. I don’t know anything about wrestling, but it sounds like a good film, especially a heartwarming one. Even if you don’t know anything about wrestling, this film is definitely worth looking into. It is indeed heartwarming at times. This is one of the few movies I’ve even been remotely interested in checking out this year. It’s the kind of movie I’m surprised I haven’t seen The Rock financially back sooner considering how much he loved the business while he was in it. I haven’t seen that many films from this year so far, but this is definitely one worth watching. And the reason this film exists is because The Rock was fascinated by Paige’s story, so passion was likely another factor. Considering the end result, I’d say it was worth the wait. I honestly had no idea what this film was about when I saw some advertisement for it a bit ago and passed over it. Reading your review and an actual synopsis of it, this actually sounds like something I’d really enjoy. Sounds really interesting! Whether or not you’re a wrestling fan, this is a film I could recommend. Hope you like it should you decide to try it out!